This talented group was a part of the thriving Worcester beat scene in the early 1960s. Some of the members went on to be involved in the formation of well known and internationally acclaimed bands. 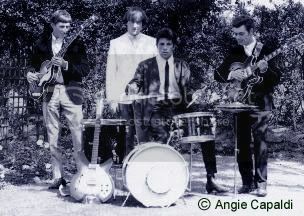 The Hellions were formed in 1963 when Jim Capaldi (born August 2, 1944 in Evesham of Italian parents) who had formerly played drums in a local group called The Sapphires, got together with guitarists Gordon Jackson from a band called Unit Five and Dave Mason who was previously in a local band called The Jaguars. Dave Mason (born May 10, 1946 in Worcester) was already known locally as a member of The Jaguars, a group that included guitarist Michael Mann and drummer Roger Moss. The Jaguars, heavily influenced by groups such as The Shadows, played mostly instrumental numbers and had taken the initiative to finance the recording of their own limited edition single which they sold at their shows and by word-of-mouth. This “independent” method of recording and distribution is common today but at that time was quite revolutionary. The early Hellions line-up tried several bass guitarists before Dave Meredith from an Evesham band called The Wavelengths was chosen to fill the position. By 1964, the Hellions were becoming well known around Worcester and performed regularly at the Flamingo Coffee Bar. The Hellions “turned professional” and accepted an engagement at the famous Star Club in Hamburg, Germany in August of 1964 as backing group to Walsall singer Tanya Day who was a minor celebrity at the time after an appearance on Thank Your Lucky Stars. The working conditions at the club were gruelling but the hard work paid off and the band became a much tighter unit due to the long hours of performing. Sharing the same hotel as the Hellions were fellow Midlanders The Spencer Davis Group whose young vocalist Steve Winwood, found much in common musically with Jim Capaldi and Dave Mason. After returning from Germany, The Hellions soon established a reputation as a musically proficient act and they were hired to provide backing to visiting celebrities such as Adam Faith and Dave Berry. By the end of 1964, the group had made the right connections to secure them a residency at the trendy Whisky-A-Go-Go Club in London where they were seen by visiting American record producer Kim Fowley and songwriter Jackie De Shannon who was at that time writing hits for The Searchers. Jackie was impressed enough by the group to offer them a song to record and helped to arrange a contract for the Hellions with Piccadilly Records, a subsidiary of Pye. The Hellions first single, entitled Daydreaming Of You, composed by De Shannon, was produced by Kim Fowley, who had previously worked with Birmingham’s Rockin’ Berries and would later produce the N’Betweens (later to become Slade). The Hellions record was certainly commercial and had an American west coast feel, but neither it or two other underrated singles released by the band in 1965 managed to reach the charts. However, a Hellions composition Shades Of Blue was recorded by lablemates The Rockin’ Berries as a track on their first album. Though success in the charts was not forthcoming, the Hellion’s work schedule remained busy and they soon went on tour to back the notorious American vocalist P.J. Proby. John “Poli” Palmer joined the band on drums later in the year which allowed Jim Capaldi to front the band as vocalist. 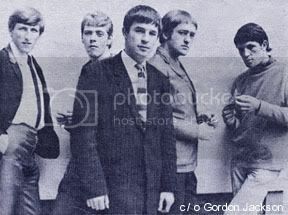 By 1966 with business expenses mounting, The Hellions moved back to Worcester, but the local scene had changed while the group were away in London. In a comeback attempt, the band’s name was changed to The Revolution in time for the release of the group’s fourth single entitled Hallelujah. By this time Dave Mason had left but undaunted, Jim Capaldi brought guitarist Luther Grosvenor (born 23 December, 1949 in Evesham) into the line-up and the band’s name was changed to Deep Feeling (see Deep Feeling).